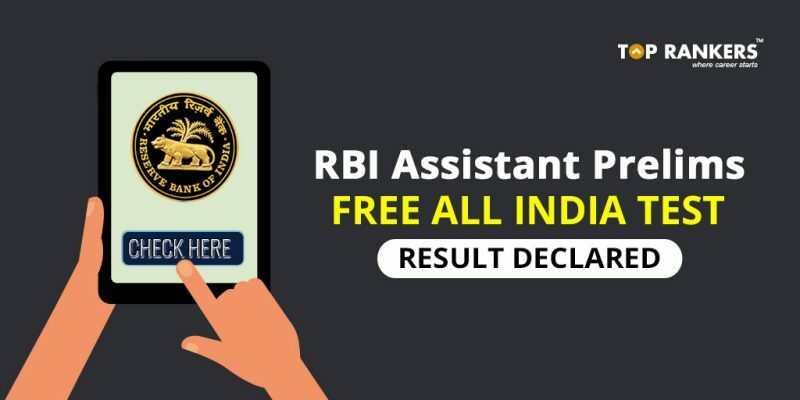 RBI Assistant Prelims Free All India Test Result Declared – Check the result here. Yes, you heard it right! RBI Assistant Prelims Free All India Test Result is declared. TopRankers conducted the RBI Assistant Prelims Free All India Test from 17th November to 20th November 2017. This test was held to help you – the aspirants – assess your skills and performance. And you can check your result today. To give your feedback on the exam, click on the button below. And you will get a chance to win exciting prizes! First of all, click here. Then, log in to your account. After that, scroll down to find the test you took. You can see a Report button next to the test you took. Click on the Report button; your result and rank will display on the screen. Furthermore, you will also get your personalized performance report. You will be able to see an in-depth analysis of your strengths and weakness. This test will help you immensely in learning where you stand. It is almost like a predictability tool for your score in the real exam. We heartily congratulate all the toppers of the test! And we are giving exclusive coupon codes to all the toppers of the test. You can check the names of the toppers and the respective coupon codes below. You can avail discount on our Mock Test Series package as listed in the table. And this discount is valid only for the toppers as mentioned below. We conduct All India Tests on a variety of exam like SSC CGL, RBI Assistant, IBPS PO, etc. regularly. This is to help you analyze and improve your performance on a regular basis. So, tell us, did you like our post on RBI Assistant Prelims Free All India Test Result Declared? Then, keep visiting us regularly for more exam and result updates.